The much awaited visit of Global Humanitarian and the finest exponent of Yoga from India Sri Sri Ravi Shankar for an event on yoga at the European Parliament, Brussels brought an air of freshness and new energy to the world’s largest legislating body. The Art of Living Founder and global humanitarian, Sri Sri Ravi Shankar addressing the decision makers at the European Parliament on 'The Yoga Way'. The insightful discourse on yoga, the interactive question and answer session with Sri Sri and the relaxing meditation enthralled the audience composed of Members of European Parliament, DGs, European Commissioners, Ambassadors from various countries and several others. The event created a lot of buzz in the corridors of the legislating institution of the European Union. 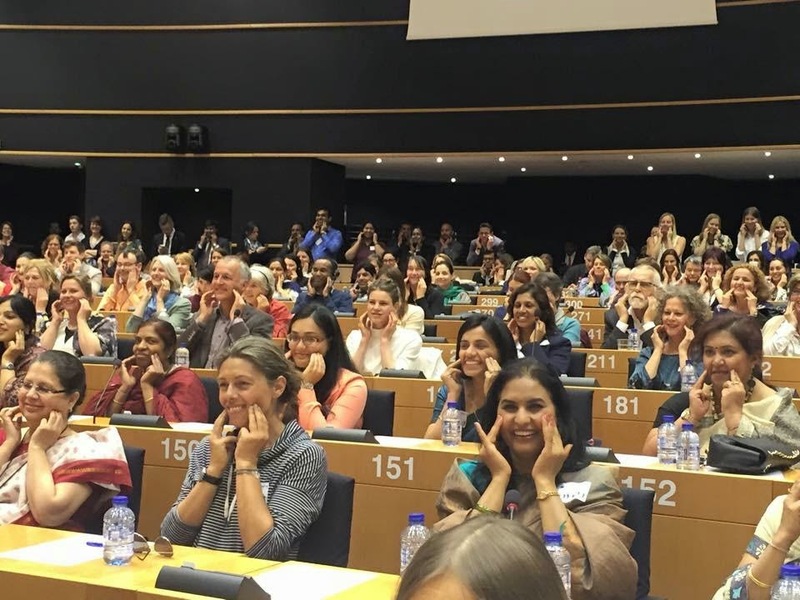 As a curtain raiser event to celebrate International Day of Yoga 2015, Sri Sri Ravi Shankar was invited to speak on yoga and lead a meditation session in the European Parliament by the Delegation for Relations with India and supported by 11 MEPs. It was for the first time in the history of the European Parliament that any event had found resonance amongst members from all the seven political groups in the Parliament. Members of the European Parliament get hands on training in Desktop Yoga at the "The Yoga Way" by Sri Sri Ravi Shankar. Sri Sri was received in the European Parliament by Ambassador of India to EU, Belgium and Luxembourg, Manjeev Singh Puri and 5 MEPs Geoffrey Van Orden, Nirj Deva, Neena Gill, Jo Leinen and Alojz Peterle who were the key players for organising the event. “Sri Sri’s message is not rooted in any one religion but is relevant to those of no religion and to all religions.” said Mr Van Orden while addressing the Parliamentarians. This was followed by a brief welcome speech by Ambassador Puri and playing of a video of Indian PM Modi’s exhortation at UNGA for declaration of International Day of Yoga by UN. A short film on Sri Sri Ravi Shankar was also played during the event. “Today, Yoga has become a public good for the world and it is one of the many Indian contributions to the world towards a holistic approach to health, well being and peace. Something that has emanated from our culture is now reverberating all over the world and finds a place in the largest legislature - the EU.”said Ambassador Puri. A packed hall with at the European Parliament listening to The Art of Living Founder, Sri Sri Ravi Shankar speak on the relevance of yoga in Brussels. Over the years, The Art of Living has been actively engaged in promoting good health and has taken the ancient knowledge of yoga across the globe. The organisation has successfully been conducting ‘Yogathons’ which has attracted audiences world-wide. This unique event aimed at promoting the multiple health benefits of Yoga has garnered huge response from people from all walks of life and was attended by 1.29 million in 2012 followed by 1.8 million in 2014, in locations ranging from schools, colleges, parks, stadiums, prisons, and rehabilitation centers to malls, orphanages and clubs. Here is the video of The Yoga Day event talk by Sri Sri at the European Parliament.